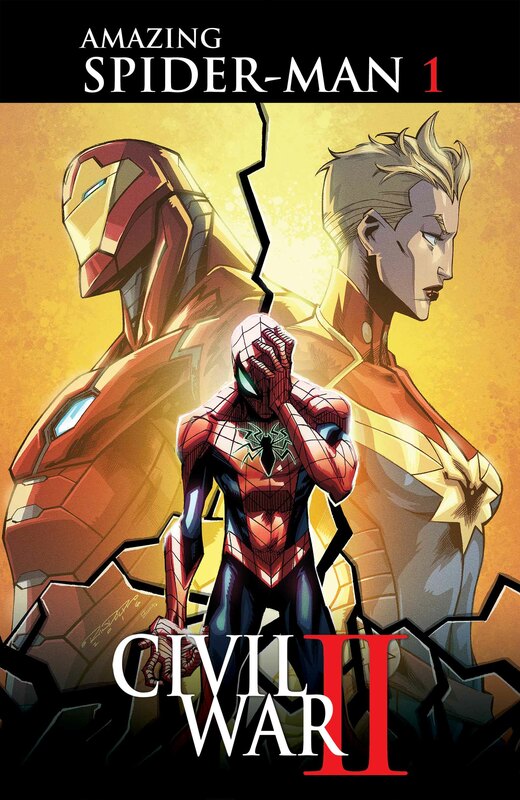 Spidey Swings Headlong Into War in CIVIL WAR II: AMAZING SPIDER-MAN! As the Marvel Universe fractures and splinters in the wake of Civil War, your friendly neighborhood Spider-Man must make his choice! Be there as he gets caught up in the fight in CIVIL WAR II: AMAZING SPIDER-MAN #1 – a new dedicated Civil War II series from writer Christos Gage and artist Travel Foreman! There’s a new Inhuman with the ability to predict the future. The Marvel Universe stands at a crossroads. Do its heroes wield this power to change the future as they see fit, or do they reject it and allow tomorrow to unfold unaltered? Iron Man and Captain Marvel stand on opposite sides of the issue, but one thing is for certain – this new Inhuman bears an immense responsibility to use his powers safely. And if there’s one person who knows a thing or two about power and responsibility – it’s the Amazing Spider-Man. The drums of war beat for the webslinger, and big changes are in store. Will Peter Parker stand with Captain Marvel? Or will he side with Iron Man? Find out this June in CIVIL WAR II: AMAZING SPIDER-MAN #1!